Basil's Blog: Deem and Pass dead? It's a trap! House Democrats have scrapped the "deem and pass" (AKA DemonPass) tactic for ramming through the health care takeover bill. 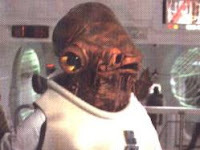 Admiral Ackbar 's words were never truer: It's a trap. I'm just not sure who the target of the trap is. Is this a stalling tactic, to get the phone calls to stop? The House already voted to "suspend the rules" approve the "Slaughter Solution". That vote essentially assured the passage of Obamacare as Don Surber pointed out. So, now I'm wondering: If they have the votes, why the sudden change in strategy? The strategy of tying the vote to "Deem and Pass" the Senate bill to the Senate bill itself was successful. There is no cover. Have the Dems decided that it's too late, and they might as well vote in the light of day and face (or damn) the consequences? But this really doesn't make the most sense. To me anyway. Note that the strategy isn't to modify the bill, but to offer a second package of amendments separately. The plan, as I understand it, is to "make it clear" the intent of the House. But that's not how it works. If the amendments aren't attached to the Senate bill, then once approved, the Senate bill goes to the president for signature. The Senate can ignore the amendments. If that's supposed to give House Democrats cover, it's not. What are they going to do, go crying to the voters in November, "We told the Senate we wanted these changes, but mean old Harry Reid and bad old Barack Obama broke their word. It's not my fault!" They'll sound like a bunch of little tittie babies. Because that's what they are. If the House Democrats want to spring a trap, it's simple: set a trap for the Senate. Approve the amendments as part of the Senate bill, and send the modified bill back to the Senate for action. The Senate won't pass it, and the health care takeover will die. House Democrats win because they'll say, "We passed a good bill and those mean old Republicans in the Senate killed it!" They are whiny little tittle babies, remember? House Republicans will win because even though they'll be out-voted over the amendments, the bill will eventually die. Plus we'll get a good look at RINOs that vote for the amendments, but against the bill. The American people will win, because this health care monstrosity will die. The losers will be the Senate Democrats, who won't be able to pass health care. But really, do we care if Senate Democrats lose? But, I suspect that's not the trap the House Democrats are planning. No, they're looking to pass health care, with separate amendments, thinking that the American people like the bill, but don't like the process. They're about to find out that we don't like either.